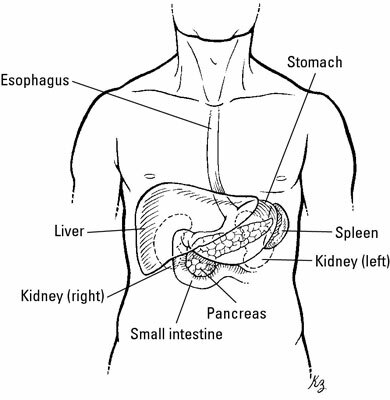 Most of the pancreas lies behind the stomach, as shown in the following diagram. Any tumors that grow can’t be felt until they’re so large that the cancer is very advanced. For this reason, pancreatic cancer has a high mortality rate. About 42,500 new cases occur in the United States every year, and 35,250 deaths occur from pancreatic cancer. The location of the pancreas. Pancreatic cancers usually arise from the tissue that makes the enzymes for the small intestine rather than the tissue that makes the hormones. This cancer is called a “silent killer” because of a lack of early symptoms and nonspecific later symptoms. Other pancreatic cancers arise from the hormone-producing cells of the pancreas, called the islets. These cancers can be silent or they may cause low blood sugar (hypoglycemia) due to an insulin-producing tumor (insulinoma). The diagnosis of pancreatic cancer is usually made at a late stage, when a patient complains of pain in the abdomen, has experienced weight loss, and has jaundice. The patient then usually has a computed tomography (CT) scan to find the location of the cancer. If the tumor is still localized to the pancreas, the first line of treatment is surgical removal of the tumor. Next, chemotherapy is given, but this is usually just to give the patient a few more months to live. Because pancreatic cancer is usually diagnosed late and the recovery from the disease is rare, some think that prevention is more feasible than treatment. Up to 30 percent of pancreatic cancer may be prevented by stopping smoking. The amount of ultraviolet B irradiation from sun is inversely associated with the occurrence of pancreatic cancer worldwide. Calcitriol and drugs designed to act like calcitriol can slow the growth of pancreatic cancer cells in culture and in animal models. In a few studies, pancreatic cancer risk was higher when vitamin D intake was lower than 150 IU per day. Protection due to vitamin D was maximized when intake was over 300 IU per day. Although these findings are promising, there are a number of studies showing that high blood levels of vitamin D might be harmful! One study pooled the results of seven other studies and found that serum 25-hydroxyvitamin D levels greater than 40 ng/ml [100 nmol/L] doubled pancreatic cancer risk. Another one saw an even higher risk in smokers. It’s studies like these that make some vitamin D experts cautious about blanket recommendations to raise vitamin D intake to high levels. If the cancer-preventing effects of calcitriol are real, it may be that the doses currently recommended for bone health are all that’s needed to achieve them. The evidence for pancreatic cancer is consistent with other studies that show it’s important to avoid becoming vitamin D deficient (serum 25-hydroxyvitamin D levels less than 10 ng/ml [25 nmol/L]).